For most mothers, a good time to start introducing solids is around the six-month mark (if you've been breastfeeding exclusively), but it can start as early as four months. Until your baby reaches six months, there is no need for solid foods as breast milk contains all the nutrition your baby needs to grow. 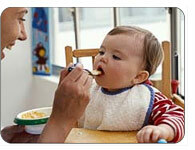 Look to your baby for cues that he's ready to start eating baby food. It is generally advised that parents follow some loose recommendations in the order and type of food they give their infant. ensure your baby gets proper nutrition by being a good example yourself; preparing healthy meals for the whole family even when your children are still babies prepares them for a lifetime of healthy eating habits and will help learn about important nutrition facts. Limit your baby's diet of saturated fats, like fried foods and too much refined sugar, such as candy. Remember to avoid foods that can pose a choking hazard to small children, like popcorn and seeds, as well as foods that can cause an allergic reaction like peanut butter. These foods should be avoided during the first year of a baby's life. For more information on food allergies and your child, click here. Remember that when you start introducing solids to your baby, their stool will lkely change, becoming stronger in odor and less watery in consistency.